As a rule, I’m hesitant to mention Bob Brenly in the posts I write on the off chance it might bring up repressed memories of watching any of the Cubs teams for which he broadcast. In these heady times for the franchise, no one needs to be reminded of…say…Milton Bradley throwing a ball into the right-field stands and then being reminded by 38,000 people that there were only two outs. To be fair, that throw was the one of the few times during his tenure with the Cubs that Milton generated a launch angle effective enough to make the bleachers. Nonetheless, today’s piece has its roots in a comment Brenly recently made about one of our heroes so my please accept my apologies for any mental anguish that results. As you might recall, during his tenure in the Cubs broadcast booth, Brenly liked to pick on certain players who provoked his old school baseball ire. Sometimes it was amusing as when he implored Welington Castillo to “RUN! RUUUUUUUN!” in the tone of voice one would normally use to announce the secret ingredient of Soylent Green. Often, though, Brenly made his critique sound more like a personal vendetta, and it only served to turn certain meathead portions of the fanbase against a great player like Aramis Ramirez or a respected clubhouse presence such as Alfonso Soriano. While he could provide some very good insights into the game, there were many times Brenly could just as well have ended his analysis by hanging up on Len Kasper and listening for his answer. And even though it’s been five years since he was a part of the Cubs broadcast booth, for some reason he just can’t stop doing this when he discusses his former team. As was the case a week ago while he did color for a Cubs/Diamondbacks epic spring training clash. 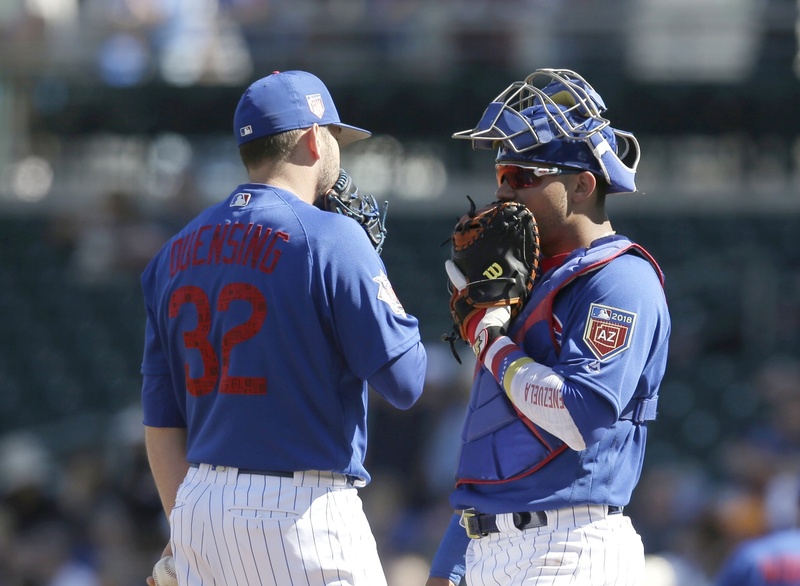 Early on in the game, Brenly declared for everyone watching that MLB’s new mound visit limit should be called “The Willson Contreras Rule.” At which point, he and Arizona play-by-play man Steve Berthiaume launched into a rant about the four and a half hour playoff games the Cubs played last October and how they couldn’t stand to see the abomination Contreras had made of Abner Doubleday’s grand invention. Honestly, I have no idea why Brenly decided to keep reliving the role he filled as Cubs broadcaster. Even a Cooperstown-level grudge nurser like Steve Stone doesn’t mark the start of every crosstown series by demanding that Brian Duensing call the press box to challenge him to a fight. First: the Cubs only played one four and a half hour game last postseason. The others ranged from 3:02 to 3:57 with the vast majority of times falling closer to the former. Second: Remember that 4:37 Game 5 of the NLDS? Of course you do because it was a-m-a-z-i-n-g. You know a playoff game is going to go down in history if the time of game is thrice as long as the time you were able to sleep afterward. As Tommy Pham can attest, Willson Contreras is Casey MFing Stengel. Odds bodkins. If that strike zone was any tighter, it would have been Kyle Farnsworth’s pants. According to Brooks, the triangles represent pitches thrown by Cubs pitchers and the shaded area outside the zone marks “the strike zones that all umpires generally call.” Look at how many triangles fall on those lines for both lefties and righties. And here’s the most important part: notice that exactly one of those pitches was actually called a strike. Last year, Contreras’s pitch framing skills drastically slipped. His framing runs totaled -4.4 at the end of the season compared to 2016’s much more acceptable 6.0. And as you can see by the charts above, that precipitous decline was especially noticeable as Kyle Hendricks and a parade of relievers agonizingly attempted again and again to find one of the corners of Layne’s zone. If Contreras could have presented a few of those pitches on the shaded line for strikes, that would have led to more advantageous counts for the Cubs. And especially with a pitcher like Hendricks, more advantageous counts would have led to more (and quicker) outs. As you can probably guess, more outs would have produced a faster-paced game. That’s the lesson Contreras needed to take from Game 5. Improving his pitch framing would have resulted in helping speed up the game while simultaneously (and more importantly) benefiting his pitchers. If this particular lesson was any more of a win/win, it would have ended with Wade Davis pitching to Bryce Harper. It’s worth noting that Contreras and Bob Brenly drew two distinctly different conclusions from the epic Game 5—one chose to complain while the other chose to improve. And their responses went a long way toward illuminating why Willson is the one involved with the game on the field instead of talking into a microphone. And if Contreras’s return to his old form also brings back his framing skills from 2016, the only time he’ll have to visit the mound will be to shake Yu Darvish’s hand. Brenly seems to direct the majority of his negativity toward Hispanic players. Just sayin’.